The Aeropole System has just come out with Version 2.0. So we're putting Version 1.0 on SALE! Version 2.0 has increased flexibility in the poles. 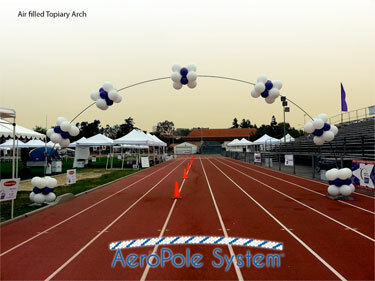 While in Version 1.0 the minimum arch length is 5 poles or 25 feet. In Version 2.0 the minimum arch length will be 4 poles or 20 feet. The base plates in Version 2.0 will be powder coated. Version 2.0 will cost 6% more than Version 1.0 ($475.28). Version 1.0's regular selling price was $448.27, but it is now on sale for $367.00. That's a savings of $108.00 for the Aeropole System! Get all the information here. We just wanted to say a big thank you for all the love, prayers and support we have received the last few months. We're very happy to be able to continue to work in this industry filled with so many caring and wonderful people! Copyright © 2014 Continental Sales, All rights reserved. You are receiving this email because you opted in on our website or in person.